Troy Brouwer did a lot of hitting this year. To be specific, he hit two hundred and forty-seven times, leading the team in this category and landing in the top ten hitters in the NHL overall for the second year in a row. 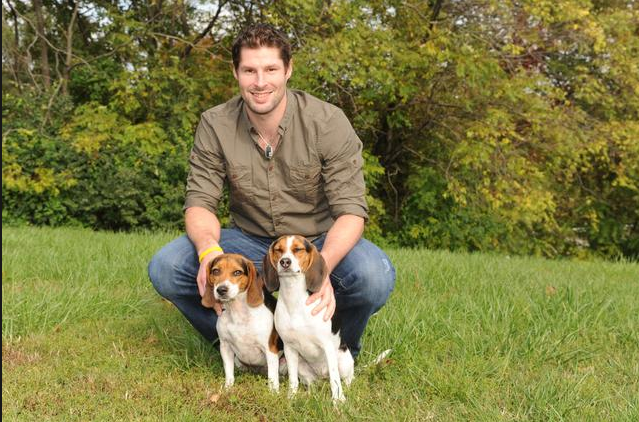 Shockingly, he also found time to do other things in between destroying opponents, such as score, and hold dogs. We are in favor of players who can multitask. You can stay, Troy. Cap Hit: $2.35 M. Brouwer is signed through 2012-13, and will be UFA at the end of that contract. Milestones: Brouwer played all 82 games for the first time in his career, and had a career-high five fights. Best Moments: His hat trick against the Tampa Bay Lightning, and his GWG in Game Five against the Boston Bruins. Team Role: Troy Brouwer was picked up in order to hit, score, and to make sure that goalies saw more of his posterior than they did of the puck. Execution of that Role: We would have liked to see Brouwer crash the net a little more, but he was a solid Top-6 player for much of the season, easily slotted alongside any of the team’s stars to add a little physical presence. Postseason Performance: Though his Game Five goal was pivotal, Brouwer only had four points throughout the postseason. Great color, great shape. Nine out of ten. Likeliness to Return: Eight out of ten. Brouwer seemed to fill the role he was acquired for pretty well, there’s really no reason to move him at this time unless someone makes us an offer we can’t refuse. Usefulness in a Post-Apocalyptic Setting: Nine out of ten. Anyone trying to steal supplies gets a shoulder to the face. For statistical analysis of Brouwer’s season, see Japer’s Rink or Peerless’s upcoming piece.